Welcome to the start of the second AHIQ invitational. We were thrilled that so many people chose to join in with the first one and enjoyed the experience of seeing how others interpreted the theme and of learning from what was shared on the link-ups each month. The thing I found the hardest when I started my first challenge piece was the feeling that I had to stick to something close to a traditional Chinese Coins quilt. That traditional block felt like a constraint that blocked my creativity and I had to get past that in order to progress. If you read my posts you may remember that one of my 'a-ha' moments, which enabled me to get over myself was when I saw this post by Barbara Brackman. It reminded me that I could tinker around with things and seemed to point out (gently and politely) that the limitations I was struggling with were chiefly in my head. On a more practical level it resulted in the addition of pinwheels. While I worked I kept mulling over the quilts she shared in that post,which I had found very appealing. That thought process has resulted in this quarter's challenge which is to make a piece of work that combines/incorporates two blocks. Hopefully this is a challenge that builds on the previous one; you could choose to carry on working with coin-style units if you wanted, and for this reason many of the images we have collected use either striped fabric or pieced strips as one part of their design. However, please also feel to branch out in a completely new direction if that's what floats your boat. In fact, there are a number of different ways in which this might work, so here are some examples. (Where I've shared an image rather than a link,you can click on the picture and it should take you back to the original post). 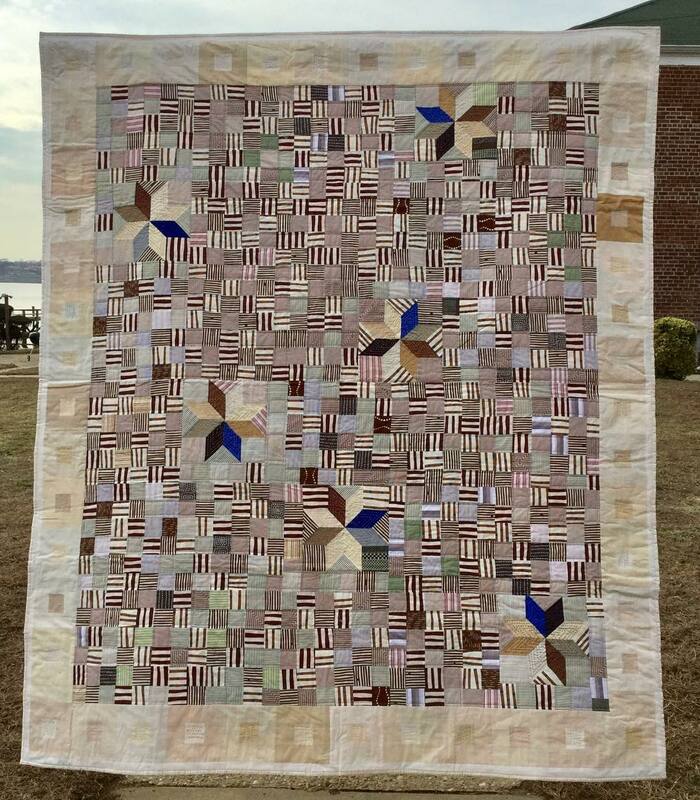 Barbara Brackman's examples include strips alternating with 9 patches, with pinwheels, with Shoo Fly blocks and with Single Wedding ring blocks. And here's a couple of other examples where the two blocks alternate in a pretty straightforward way. This quilt alternates Square in a Square with stripes@ traditional, simple but striking. And moving a bit more up-to-date, Malka Dubrawsky used striped fabric to surround her stripy square blocks and Margaret (margaret-pw on instagram) produced this lovely,muted combination of stripy squares and star blocks. Of course, you might end up with something far removed from traditional versions of your two blocks. There are plenty of examples of this freer approach amongst African-American quilters. Here's a small selection, all from the Souls Grown Deep website. This quilt made from shirting fabrics combines blunt-nosed triangles, stripes and pieced strips in a crazy yet harmonious whole. 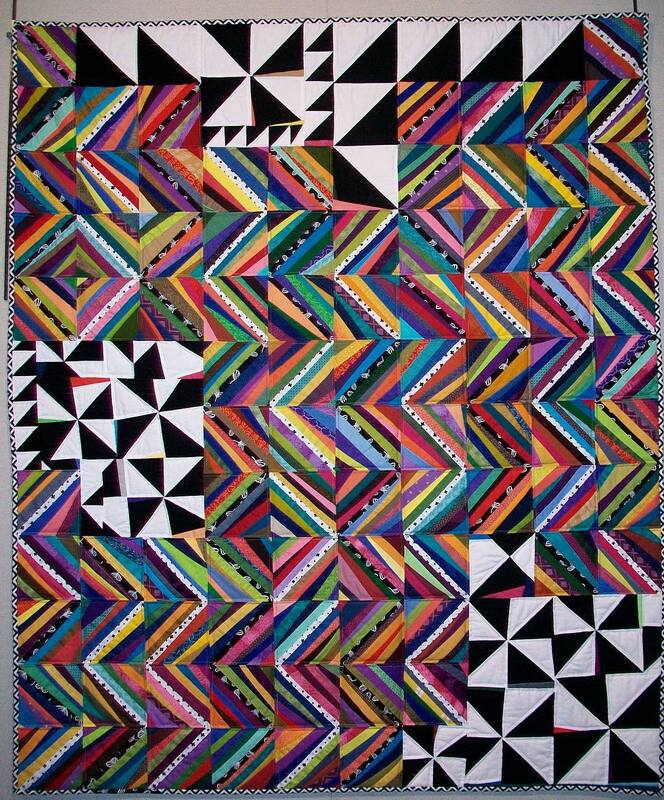 This quilt, also by Margaret P_W, uses bright strings and black and white triangle units. This started life as two separate projects but came together in a striking improv quilt. Of course, since this is an improv challenge you could head in any direction with it. You could create your own blocks/units rather than using traditional ones. You could begin with an idea for using two blocks and end up with a quilt that uses 3 or 4, or where only one remains by the end of the process - there are no rules, just a starting point. If you want more ideas, Ann and I have put together a Pinterest board with lots of gorgeous inspiration, covering everything from modern quilts to Welsh antiques to African textiles. In fact, even if you don't need the ideas, it's worth a look! So if you are joining in,and we hope you are, let's get started and meet up back here on next month's AHIQ link up where we can share where we are, what we've discovered, and any questions/thoughts that have come up. If you are an Instagrammer, you can tag your photos with the hashtags #AHIQ2017Invitational and #AHIQtwoblocks so everyone can find them more easily on social media. Oh my goodness - I have a project that has been on my list for a long time and this quarter's challenge will be the PERFECT time for it to move to the front of the line! Thanks for a post rich with links and ideas (but the Pinterest board link didn't work from my computer). Looking forward to this two block improv challenge! I'm also adding a link back to a quilt I made in 2011 that features two very different blocks (asterisks and crumbs). I will add my link tomorrow when I take a picture of my materials that I will be using. This will kill two birds with one stone for me - I will explain that tomorrow! I love this post! Thanks for all the links and resources to explore. Love your new quilt top because it doesn't look like Chinese Coins at first glance. Great way to improvise on the idea. Plus using old shirts is always fabulous. Your pinwheels segue into this quarter's idea beautifully. And what a wide open topic this can become. I want to go through all the links again with another cup of coffee. Am really enjoying your 2017 challenges, even if I am slow about it! I think I've told you before, but this newest quilt of yours is one of my very favorites. Love the way it presents, kind of with an old time charm and that whimsy that you seem to be a master of! Thanks Kaja and Ann for hosting AHIQ, I think it's a great idea, so much inspiration. I am in. After being down some kind of Pinterest rabbit hole I finally have got to see that board and it has given me the germ of an idea. I am away from home for awhile caring for my mother, and have brought a bag of solid scraps and some hand needles and thread and scissors. Let's see what I can come up with during the long evenings! Yikes, my head is bustin' open with ideas. Thanks! I'm loving the challenges. Thanks for all the research and links. I like the direction your Chinese Coins took. I need to work on mine. I'm too easily distracted by the garden this time of year. i'm not promising, but I really want to join in on this challenge. I've enjoyed watching the progress of this Chinese Coin of yours, the addition of the pinwheels was a great choice, looks lovely - and now I guess it's waiting in the line for quilting! This post is awesome Kaja, I don't often use that word but I think this is the perfect post to do so. I have gone over it many times, it is so interesting, your thoughts and ideas for this next quarter are exciting! I have long been a fan of two-block quilts, but I really like the improv angle of the ones you've shown here. So much inspiration. Thanks for all that you and Ann do. The Pinterest board is wonderful!! This is a great post, Kaja. 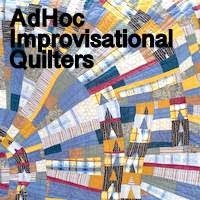 Thanks for all the links to photos and posts about other quilts that are examples. I noticed that you mentioned "AHIQ Invitational" and wondered if participation is by individual invitation or if anyone can participate.